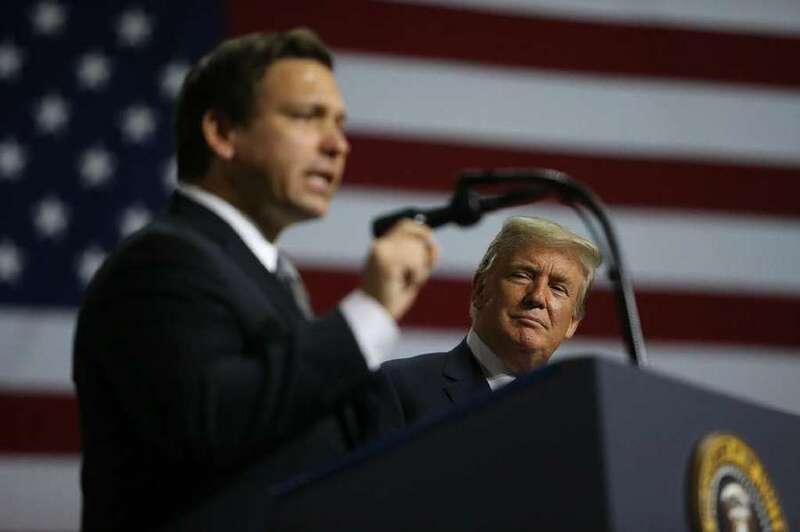 In his first public visit to Tampa since taking office, Trump encouraged a near capacity crowd of thousands at the Florida State Fairgrounds to back U.S. Rep. Ron DeSantis for governor. TAMPA — Declaring himself the most popular Republican in the history of America, President Donald Trump revved up thousands of fans Tuesday night at a rowdy Tampa Bay campaign rally to help gubernatorial candidate Ron DeSantis and, above all, celebrate Donald Trump. 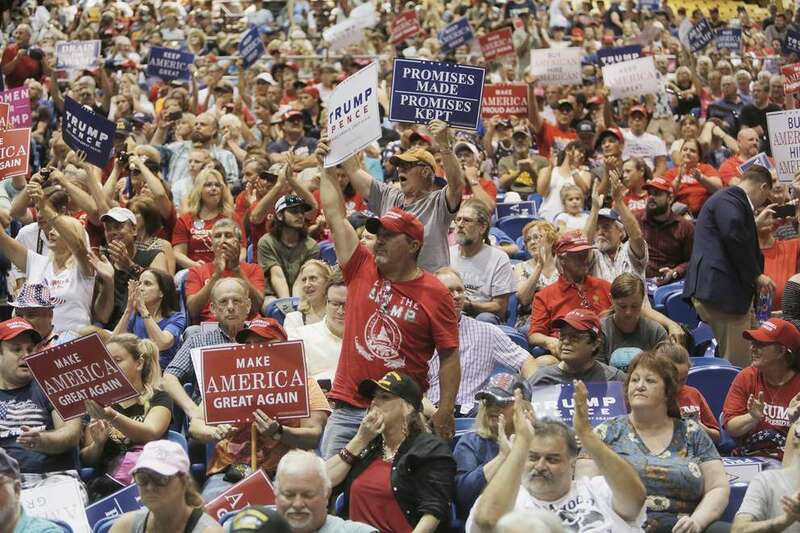 "This may be — in fact it probably is — the greatest movement in the history of America," Trump told the overflow crowd of about 10,000 filled with red T-shirts and Make America Great Again caps. "To keep it going we need to elect more Republicans. And we need to elect Ron DeSantis as your governor. … He's going to be an incredible governor. I have no doubt, no doubt. I don't do these endorsements easily." Party leaders typically avoid taking sides in competitive primaries, but Trump has relished showing off his popularity and influence by endorsing preferred Republicans. DeSantis is running against Agriculture Commissioner Adam Putnam, a once-rising star in the Florida party who has struggled since Trump publicly endorsed his opponent June 22. 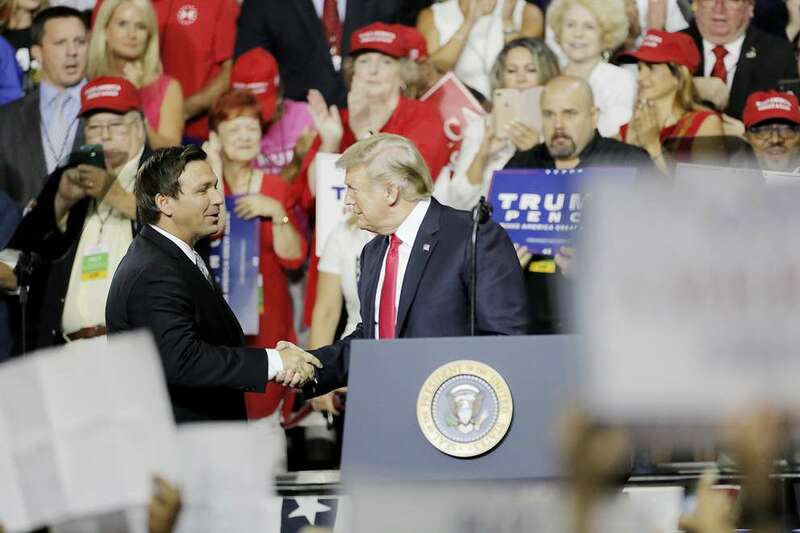 "I appreciate your support, Mr. President," DeSantis said before Trump launched into his hour-long speech. "But I appreciate more the leadership you're showing for our great country." 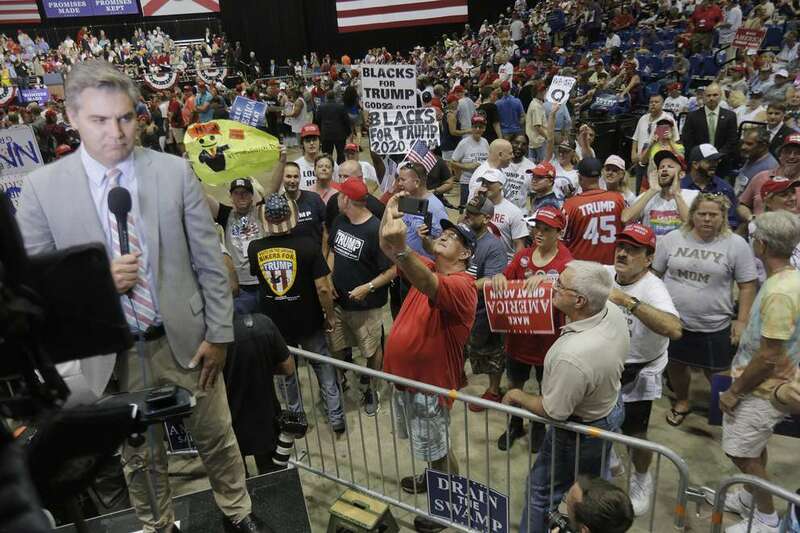 Tuesday night's event at the Florida State Fairgrounds harkened back to Trump's high-energy, crowded rallies during the 2016 presidential campaign against Hillary Clinton, which most pundits expected him to lose. Standing in front of a "Promises Made. Promises Kept" banner, he attacked the "fake media" and drew chants of "Build the wall! Build the wall!" He sprinkled in false claims (people need an ID to buy groceries he said at one point), plugged his hotel in Washington, and even mentioned "Crooked Hillary." One new element of this Trump was the widespread presence of people wearing T-shirts or carrying signs touting the fringe "QAnon" conspiracy theorist. Among other things QAnon promotes is the notion that leading political and Hollywood elites are involved in a pedophilia ring and that leaders of the federal government's "deep state" have tried to kill President Trump. Not so long ago, Republicans talked of making their party a big tent party that would welcome moderates into the fold, said Republican former U.S. Rep. David Jolly of Pinellas County, who attended the rally despite being a vocal critic of the president. "Now we're a big tent party where extremists are welcome." As the crowd periodically erupted in chants of "USA! USA!," Trump talked of the strong economy, from low unemployment to the bullish stock market. He noted that he moved the U.S. embassy in Israel to Jerusalem and said America is respected again abroad. He compared himself to Abraham Lincoln at one point, and channelled Winston Churchill at another. "We will never give up. We will never give in. We will never back down. And we will never surrender," he said to roars from the crowd. "Our hearts bleed red, white and blue…. We will make America wealthy again. We will make America strong again, and we will make America great again." The president took the opportunity to hail Gov. 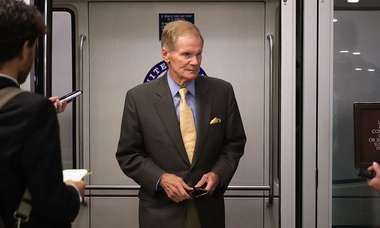 Rick Scott for U.S. Senate and blast Democratic incumbent Sen. Bill Nelson. Nelson voted for the Affordable Care Act, Trump said, and is soft on "criminal aliens." So how did Jeff Greene do at the Trump protest? Polls consistently show more than 8 in 10 Republicans approve of the president's performance, and his campaign stop for DeSantis came as mail ballots are arriving at tens of thousands of homes across the state. It was a lousy birthday present for Putnam, who turned 44 while campaigning in The Villages and was doing his best to downplay Trump's visit. "I'm confident that there's an awful lot of Trump-Putnam voters out there who want a governor who actually understands the challenges facing them and puts them first," said Putnam, who also has lauded Trump's record as president. Air Force One touched down in Tampa around 5:30 p.m. 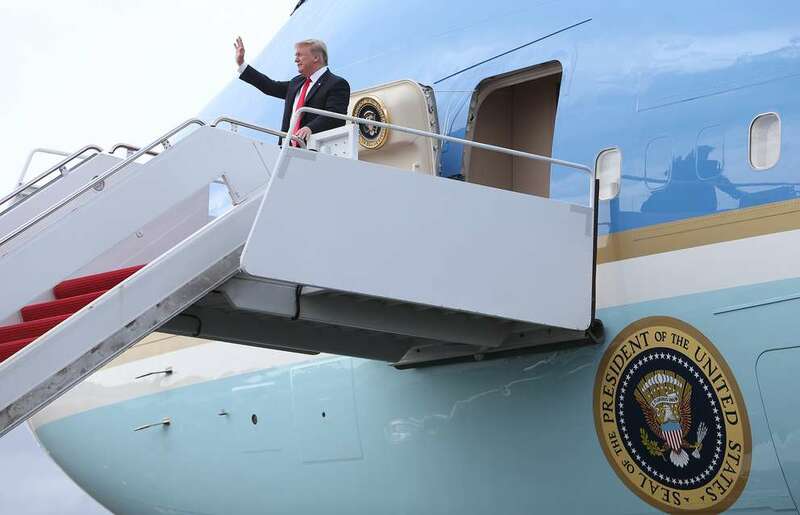 Supporters, including Florida Attorney General Pam Bondi, greeted Trump as he walked off the tarmac at Tampa International Airport with Scott and Secretary of Education Betsy DeVos. U.S. Reps. Gus Bilirakis and Matt Gaetz, two Florida Republicans running for re-election, joined him as well. The motorcade made its way through downtown Tampa to Tampa Bay Technical High School. There, Scott and Trump's daughter, Ivanka Trump, addressed the high school audience. U.S. Rep. Ted Yoho, another Florida Republican, was in attendance as well. Trump said people watched his rally on TVs outside the Fairgrounds. They didn't. Ivanka Trump introduced her father as someone "who keeps his promise and who will always deliver for America's workers." Later, Trump ceremonially signed one of the first major education initiatives of his administration — the Strengthening Career and Technical Education for the 21st Century Act. The bipartisan legislation reauthorizes $1.2 billion for local technical education and shifted decisions on how best to spend the money to states and local community colleges. Trump said the bill gives students better access to jobs in this "incredibly booming economy." "There's never been a better time to learn a trade in this country," Trump said. Trump supporters decked out in American flag gear and Trump-branded apparel began lining up at the Fairground gates before sunrise, despite the July humidity and ever-present threat of thunderstorms. By mid afternoon, hundreds were waiting to get in, verbally clashing at times with groups of protesters also assembling nearby. Once inside, the crowd was abuzz with optimism about Trump's presidency. As speakers took the stage to talk about how Trump is a "fighter" who faces tough "opposition," the crowd roared in approval. Midway through, a protester was removed as Trump mocked the media, joking that the woman's removal will inspire "massive protests" headlines. Meanwhile, Trump said thousands who couldn't get in were watching outside on TV screens. But there were no massive TV screens outside. Hundreds outside did crane their necks, stand on tippy toes and listen through open doors. Some groaned because they couldn't get in. As Trump supporters discovered they couldn't get in, many made their way to the protest in the First Amendment Zone. "We just want to hear what the other side has to say," said Kristin Panozzo, 22, of Tampa. "We're disappointed we couldn't get in, but that's all right, we're here." Tuesday marked Trump's 36th rally in the Sunshine State. The real estate mogul and part-time Florida resident was a frequent visitor to Tampa Bay during the 2016 presidential campaign. He defeated Clinton in Florida en route to his election night victory — which he was sure to mention. "I love Florida," Trump said at Tampa Bay Tech. "I had a great victory in Florida." 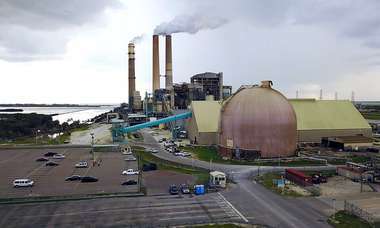 Times staff writers Bre Bradham, Tim Fanning, Emily L. Mahoney, Tony Marrero, Marlene Sokol, Langston Taylor and Kirby Wilson contributed to this story.